A singing model or a skillful songwriter? A honorable spokesman of Chinese companies or a proud Taiwanese? Different forces are linked to the Zhou Jielun (Jay Chou) enterprise, but it seems that they all push his popularity forward. 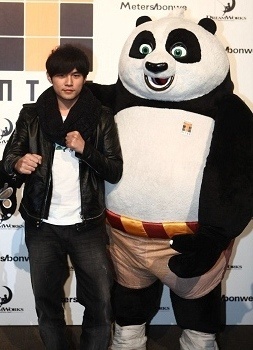 There is no doubt that Zhou Jielun, also known as Jay Chou, is more than a music artist. He presents products, he appears in movies (until the new Hollywood The Green Hornet his most celebrated role was in Zhang Yimou's Curse of the Golden Flower) and geenrally he is all over the place. Still, it is surprising to hear that many Chinese, including girls who admire Zhou, don't regard him as a 'pretty-boy'. 'His eyes are too small' is a common response I got when asking Zhou fans how come they don't think he is good looking. On the other hand, even Chinese who don't like his poppy music often express respect to the fact he has been a songwriter-singer-producer for around a decade already (though he is only 32) and that he is a true musician. It seems that the fact Zhou is engaged in many commercial activities and doesn't focus on music only doesn't make him a less credited musician in the eyes of many Chinese. Maybe this has to do with the lower level of cynicism Chinese might have towards model-actors-singers or perhaps something in his music is truly unique. Zhou shot a commercial for Sprite with NBA star Kobe Bryant not long ago, but he is also a presenter of Chinese enterprises, such as China Mobile, a local milk tea brand and various brands of clothes. The familiarity of his face was further induced through his appearance in CCTV productions, including performing a few times in the popular Chinese New Year Gala (央视春晚), the peak of national television (and of national sentiments among viewers). Overall, the Taiwanese roots mostly play in favor of Zhou Jielun's success in China. His cool style and success overseas (even if in the west he still has a way to go, in Japan, Korea and southeast Asia he is a phenomenal star), along with his familiarity with Chinese culture make him both a local role-model and a foreign star, enjoying the halo of both positions. The Taiwanese pop culture is considered as a source of many cosmopolitan stars in China. Occasionally, online debates mention the fact that Zhou is a proud Taiwanese rather than a patriotic Chinese, but usually he remains in the heart of the consensus. If most Chinese see Zhou Jielun as a talented artist who is expanding into other domains, foreigners meeting with the Jay Chou phenomenon in China first see a hugely popular star and only then might stop an listen to his music. Furthermore, the 'small eyes' isn't necessarily a drawback for such foreigners who might actually think Zhou is very good looking. In fact, Zhou announced in the past that he will sing only in Chinese and it is more likely that he wins western hearts through his acting and modeling than through his music. The differences appeal Zhou Jielun might have between East and West might be slightly transformed by small one-on-one cultural bridges, such as Westerners who are familiar with Chinese culture, who could present his songs to native friends, as well as Asians in the West, who could inform the people in their surrounding that Zhou is more than a pretty face. In any case, while Zhou might be misunderstood or not appreciated to the fullest in some domains, he still enjoys different types of popularity and, needless to say, revenues that most Hollywood stars could only dream of.